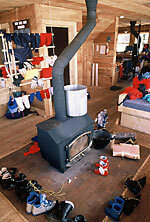 Typical hut interior includes a wood burning stove for heat. Most of the huts sleep sixteen people, but size ranges from 3 beds to 20. Beds are usually divided among three or four shared sleeping rooms. Huts are booked to capacity and are often shared by more than one group, including guide services and their clients. Overflow camping around the huts is not permitted. You can review our "Hut Etiquette" document for some helpful tips on how a little common-sense courtesy can make everyones hut trip a memorable experience. 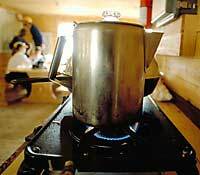 10th Mountain owned huts are equipped with wood burning stoves for heating and cooking, firewood and starter paper, matches, propane burners for cooking, photovoltaic lighting, cooking and eating utensils, TP, mattresses, pillows, and decks. You need to bring a sleeping bag, food, personal, and emergency gear. Hut users melt snow for water in the winter and collect water from streams in the summer. Hut users are responsible for drinking water purification. Amenities vary greatly, hut to hut, so please check The Huts section of this site (see menu above) for specific information on individual huts or check our Hut Amenities Chart below. Remember, dogs are not allowed at any of the huts. Failure to abide by this policy can result in fines up to $1000. Huts are equipped with propane burners. A Note About Water Filter Use: We ask that when you filter water at the huts you do not filter it directly from the snowmelt pots or water jugs. It is impossible for us to know where everyone's water filter has been and while the water coming out of your filter is clean, the intake portion of your filter may not be and that can be a source of contamination. Unless your filter is thoroughly washed after every trip bacteria and viruses can live on the intake portion of your filter for longer than you might think. It is each hut users responsibility to purify their own water but not all filters remove every contaminant with equal effectiveness. In order to minimize the chance of further contamination we ask that you fill up another large metal pot and filter water out of that instead of filtering directly from the communal snowmelt pot and water jugs. When you are done filtering your water please wipe down the metal pot and allow it to air dry. The huts do not have resident caretakers, however, 10th Mountain field personnel may be encountered on the trails or at the huts. Use links below to visit each individual hut/yurt listing of amenities. *Properties that are open Year-Round may have shoulder season or other closures. An Orange Box indicates that more details are provided on the individual hut page.